We all know what it’s like to have a telephone conversation with someone who just won’t shut up. We make polite comments of agreement like, “Mmhmm,” and “I see,” but we aren’t really listening that closely. We’re just thinking about how we can put an end to the conversation politely. Lots of times this super chatty relative is an overbearing mother, and you just don’t want to disrespect her or hurt her feelings. When you get a phone call from Mom, answer but be prepared to start ending the conversation before it even starts. Say something like, “Hi Mom. I wanted to answer so you know I’m okay, but I really don’t have time to talk right now. Can I call you back?” If you give her a chance to start the conversation, you’ll have no other chance to end it. Those telemarketers really are sneaky. You see an unknown number, and out of curiosity you answer the phone. When they immediately start their sales pitch, you regret not just letting it go to voicemail. In these situations, lots of people are tempted to start cursing or yelling, but that’s the worst way to handle things. The telemarketer is only doing his job, so avoid bad karma and don’t be mean. Politely say, “I’m not interested,” and immediately hang up. That’s that. And to avoid getting more of these calls in the future, register your telephone number with your nation's Do Not Call Registry. In extreme situations, your unwanted calls may actually be calls of harassment. 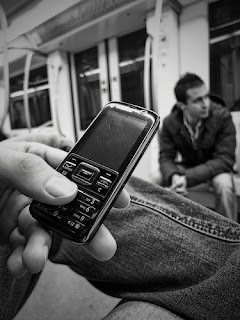 Whether it be a jilted lover, a vindictive friend, or a total stranger, harassing phone calls should be taken seriously. Try to avoid answering the calls, and do not respond to harassment. Call your phone company and notify them, and they may be able to prevent the number from calling you. If the harassment doesn’t stop or is taking the form of threats, keep a log of all harassing calls, and notify law enforcement to file a report. The police should step in and take action to stop the stalker. You may also need to change your phone number.